Click here to visit our Graphics Drivers and Software page and click on “Latest Windows Beta Driver” to download the driver. 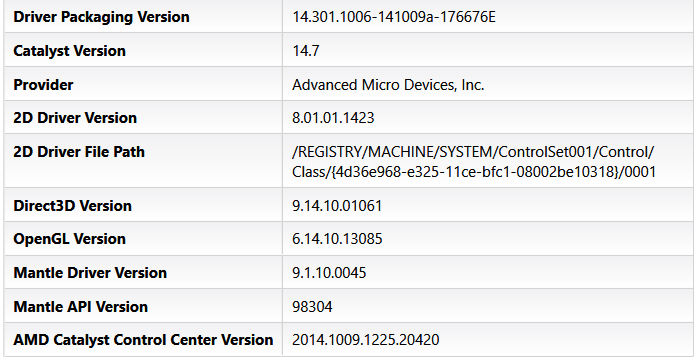 Please note the Catalyst 14.9.1 Beta driver will continue to be listed, along with the Catalyst 14.9 WHQL. This is because Catalyst 14.9.2 Beta driver is only supported on GPU’s supporting GCN hardware. Please make sure to read the Feature Highlights and the Known Issues sections to learn more about this version of the driver and use the Issue Reporting Form to report any bugs – Thank you! Yeah those are the right ones, according to the Driver Packaging Version, still saying 14.7 (or whatever version you went to them from) is normal for betas. How do you tell it's properly updated? Mantle verison? In Thief Mantle benchmark I have improvement from 53 to 65 average fps. I just go by the Driver Packaging Version at the top tbh, if it matches (i.e for these its - 14.301.1006-141009), then i know i am on the latest. Cool, yeah I had noticed that. Shame mantle still won't work on civ, something about msvcr110.dll, no amount of reinstalling the vcredist is doing anything. I'll give ddu a go tomorrow, no updates for the c++ distros around. If it's working for you, mind uploading your msvcr110.dll in the D:\Windows\System32 folder and giving me a link? Tried removing it and reinstalling but it doesn't install, seems like it's not part of that package. It includes the very latest runtimes for 2005, 2008, 2010, 2012, 2013, and C++ 14 (the new one coming out), and both x86 and x64 versions of each. Old versions of each of these will automatically be uninstalled. If programs have the c++ runtime files in their folder, it will use those instead (like how SweetFX works), meaning programs can still use old versions even if you install a later version on the computer. As stated, this beta is ONLY FOR GCN. Its a mantle update, if you dont have GCN, it worthless to you. Cheers for the help, removed the file with the loose file remover then installed with the v33 redist, same crash. I'm thinking it is a driver issue, which probably wouldn't be worth the hassle trying to fix.